The decision to withdraw 600 UK troops is the end of a very long road for the British military in Bosnia. It has been almost 15 years since the first British troops arrived. First they were wearing the blue berets of the UN, then serving under Nato and now finally with the EU. It has certainly been a much longer mission than originally planned. When Britain's then defence secretary, Malcolm Rifkind, was asked in 1992 how long British troops would be needed, he predicted their presence would probably be required for 12 months. Over those 15 years the role has changed dramatically. At first under the UN they were engaged in escorting aid convoys as Bosnia descended into bloodshed and ethnic cleansing. Often, thanks to political restraints, they were uncomfortable onlookers to the carnage. But in 1995 they took on a far more muscular role as Nato tired of what it saw as Bosnian Serb bullying and under prompting from the US decided to intervene. The fighting finally came to an end with the Dayton Peace Accords in 1995, which at first was enforced by Nato until the EU took over command at the end of 2004. Of course the EU's decision to scale back its military presence is part of a long-term trend. It is worth remembering that at one point Nato had 60,000 troops on the ground. Now the EU is cutting its troop strength from 6,500 down to 2,500. So this is not a sudden move, but rather part of a process. 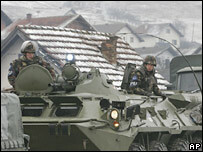 The gradual "draw-down" has been possible because the international community now believes Bosnia is stable enough not to require so many foreign troops in the county. EU officials point to the recent parliamentary and presidential elections and Bosnia's desire for partnership with Nato as proof of that new stability. That is not to say the scars of the war and ethnic cleansing are completely healed. There are still some 1.8 million internally-displaced people and prominent indicted war criminals, such as Ratko Mladic, are still at large. But British defence officials have been saying for some time that in military terms it's a case of mission accomplished and that British troops are now largely playing a policing role that should therefore be handed over to the police. Although the departure of British troops is part of a broader EU decision to restructure its operation in the country and not a unilateral move by London, it is nonetheless welcome news for defence chiefs here. Most make little secret of the so-called "overstretch" to the UK's armed forces because of their commitments in Iraq and Afghanistan, so Bosnia is one less mission to have to worry about. Eufor: A step forward or sideways?